Sign in and enter account info. Click New -> Document and you have your first blank Google Doc. If you have a Word doc you want to import, click Upload instead. Start Typing or explore (roll mouse over) each of the text editing icons to see what they do. Docs will auto-save or you can save and close. Click the INSERT tab to access additional editing and importing tools. Use the heading styles to title sections of your document (from the format menu, select Minor Heading, Sub-Heading, Heading). Then add a table of contents that will refer to those titled sections (from the Insert menu, select Table of contents). Learn more. Browse templates by category. You can sort templates by popularity or rating, and by category or type of doc. If you'd like to return to an unfiltered view of the gallery after sorting templates, simply click All templates or All categories. New filters for locating files by file type and file content. The best part of the new file list interface is the sidebar preview. Now when you click on file in your list you can see a small preview of it before opening it. If the file you select in your list is a video, the video can be played within the file list interface. Web Clipboard Chrome Extension. The Web Clipboard Extension allows you to highlight text on any webpage, right click on it, and send it to your Google Docs account where you can save it and use it in your documents, presentations, and forms. Explore provides for Google Docs users. You can use Explore to access related content, insert an image in a doc , and conduct search within your docs and across the web. To launch Explore, open a document and click on Explore at the bottom right. You can invite up to 200 people but only 10 at a time can look at a document. There are several reproducible PDF articles from Writing magazine filled with student-friendly tips and techniques for revision. You'll also find a teacher’s guide that provides you with ideas for how to use these materials with Google Docs to create innovative lesson plans about revision for your classroom. History: Google saves your doc automatically every few minutes. Click File -> Revision history to see the versions the Docs has been quietly saving while you work. This includes your manual saves also. If you want to revert to one of them, click the Back to Revision History and turn on the checkbox of the one youwant to revert to. Create a folder: Click the Create New button on your docs' page -> Folder -> give it a name and description if you want. You can also assign a color by the "choose color"
This feature allows you to work on docs, calendar and gmail without Internet connection. 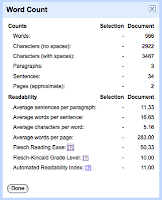 Both Google Docs and Microsoft Word provide three indicators of the reading level of the document you're creating. They will each calculate for you the Flesch Reading Ease, Flesch-Kincaid Grade Level, and the Automatic Readability Index. In Google Docs you visit the tools menu and select the word count option. In MS Word, you click on the Microsoft Office button, then select Word Options, Click Proofing, make sure Check grammar with spelling is selected, under When correcting grammar in Word, select the Show readability statistics check box. Then open your document in word and run a spell check. click the question mark for details. Assign more than one student to a document to create a "Jigsaw-like" research project. Imagine two or more students assigned to 'writing groups' with each member researching and writing about different world religions, or countries in a particular region of the world. Such a project that involve Guilded Age Robber Barons. Ask you class to individually work on a single shared documents and finish the sentences " I am Unique because..."
By requesting them to use Google Docs for the Reading Response there can be an ongoing conversation, aided by the extra motivation of working online. Youth Voices: collaborative exchanges between students in different parts of the U.S. Some innovative educators may have used one of my favorite tools for collaborative writing, Google docs, but gotten frustrated when using it with a class because students need emails, everyone must sign in and register, collaboration isn’t in real time so it is easy to overwrite the work of a collaborator, and the chat feature is clunky at best. Innovative educators need to get students off of the paper and allow them to get to the thinking and producing faster by composing digitally. The tool I recommend they use is http://etherpad.com/. Etherpad allows students to write individually, in pairs, or in groups. It tracks by color who wrote what information. It has an area for chat, and a teacher can play back and observe the writing and revision process of their students. This in essence give teachers the ability to see the writing process for any student, pair, or group anytime, anywhere. Additionally, because each participants in put is color-coded there is never a question about the level of contribution from group participants. It’s all right there. Finally, of course, since this is web-based, students needn’t be conferring with students in their classroom only they can connect with others around the globe. Create a free online newspaper.